If you’ve been following the advice of plant-based nutrition leaders for any length of time, you’re probably aware that no more than 10% of our calories should come from protein. And yes, the type of protein matters greatly (animal vs plant). Studies show that those who consume lots of animal protein have a much greater risk of cancer death and a 73x higher risk of death by diabetes; those who consume “moderate” protein (10%-19% of calories) have roughly 23x the risk of dying from diabetes. So what about the study which suggests elderly people have a higher protein requirement? As Dr. Michael Greger explains in this article, not only is evidence lacking to support that study, there’s a Japanese study which proves the opposite. A study in 2008 found NO difference in the protein requirements between young and old. When it comes to muscle mass, sedentary people over age 65 lose about 1% of their muscle mass every year, but older adults on bed rest may lose muscle mass 6x faster than young people. 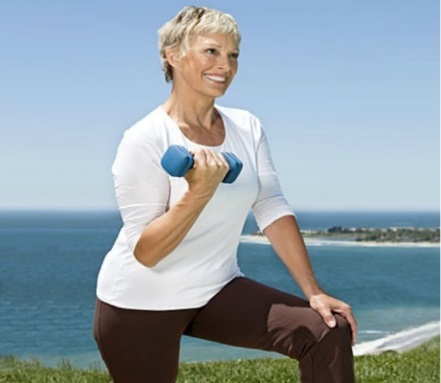 But muscle mass is maintained with exercise and strength training at any age, so it’s use it or lose it for everyone. Dietary-wise, vegetables are associated with cutting the odds of low muscle mass by roughly 50%. The alkalizing effects of vegetables neutralize the mild, metabolic acidosis that occurs with age. 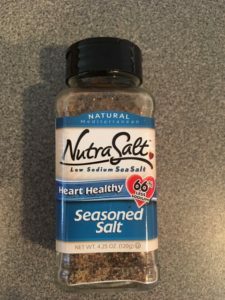 Dr. Greger explains that muscle wasting appears to be a response to acidosis (when our kidneys start to decline due to eating an acid-promoting diet which includes fish, pork, chicken, and cheese). 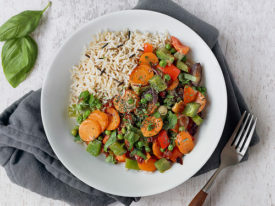 Beans and other legumes are the only source of protein that’s alkaline and positively associated with muscle mass in all women ages 18 through 79. Exercise and plant-based nutrition are key to health, vitality, and the ability to function – at any age. 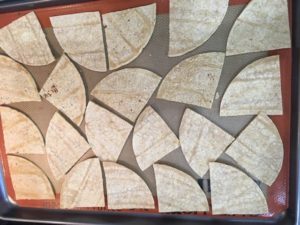 It can be challenging to find oil-free tortilla chips on the market. Sometimes even the “baked” varieties contain unwanted ingredients. But here’s a solution which is easy, cheaper, and it my opinion, much tastier! Purchase corn tortillas, the type that come in a paper wrapper. 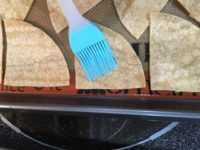 The ingredients are typically corn, water, and lime. 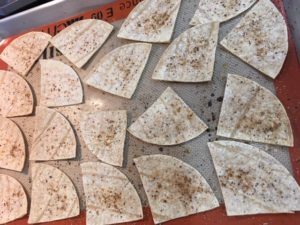 Cut into quarters, brush or spritz with a little lime juice, and add a salt (or low salt/salt-free) seasoning or other spice. Bake on a parchment or silpat lined baking sheet at 350 for 13-15 minutes until crispy (they may require more time, it depends on your oven. Keep an eye on them and be sure they’re crispy, but not burnt. They’ll harden up a bit as they sit, too.) Note: You can also make tostada shells using this method, simply bake the tortilla whole rather than cutting it. For the batch shown in the photos, I used NutraSalt Low-Sodium Seasoned Sea Salt. It packs a bit of a punch due to the added spices and paprika. 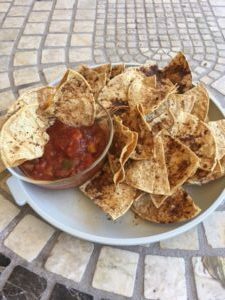 Serve with your favorite salsa (mine happens to be any mango or peach based salsa, which offsets the spices nicely). Bon Appetit! 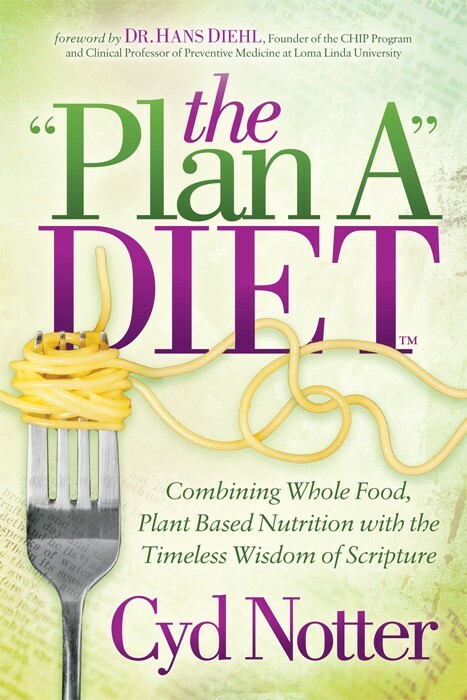 If you follow a whole food, plant-based, no-added-oil diet, you know that eating out can be a real challenge! In this brief video, Dr. McDougall says that “eating out like a war zone!” But he’s right when he suggests that ethnic restaurants are your best bet – Mexican, Italian, Chinese, Thai, and Indian, just to name a few. Of course, nothin’ beats home cooking for health and variety, but there are ways to eat out without compromising your health. We’d love to hear some of your tips, too!